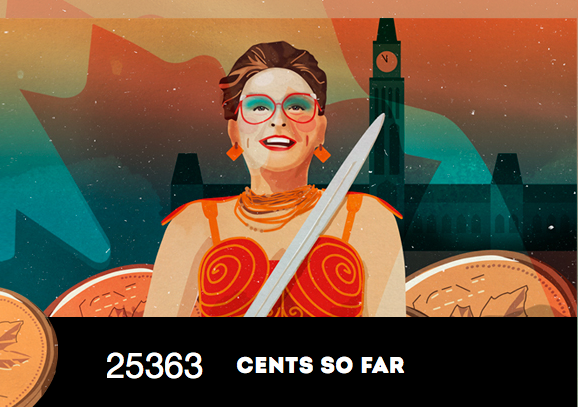 Ouno Design » Marg Delahunty says she’s going by boat to Ottawa. With her sword. Help Marg Brings Change. Click on the penny – it’s not an actual donation (though you can do that too) but it adds your vote of confidence and she matches every penny with a donation to Syrian refugees. This entry was posted on Wednesday, October 7th, 2015 at 4:45 pm	and is filed under Canadian design, film & TV, humour, politics, video. You can follow any responses to this entry through the RSS 2.0 feed. You can leave a response, or trackback from your own site.